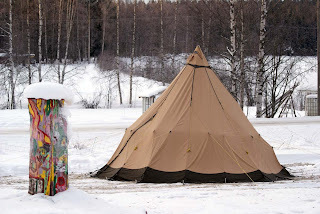 A wigwam in the middle of the winter?! Have anyone see the indians? Scott and I love your blog and are always grateful when you've written something in English so we can understand! Obviously we need to take some Swedish lessons so that all the effort to communicate does not have to be on your part. Beautiful place you live, your photos prove it. We are also wondering what is in this picture. I thought Scott would know, but he didn't. My guess: you cover the steel frame that holds the feed for your sheep? I have no clue what that colourful "totem pole" (Scott said) is.